Walking into the K. J. Villa in Uswetakeiyawa, Wattala, is a serene experience. A calm feeling spreads as you enter the villa, with its pleasant views and beautiful spaces. Trees line both the front entrance and the garden at the back and the feeling of peace that envelopes one from the first moment continues throughout the stay. 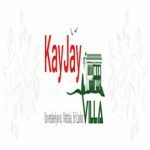 A sprawling boutique villa, the KayJay villa is an oasis of natural elements meeting man-made elements. The plants on the balconies are complemented by the creeper of tiles on the corner, while coconut trees tower over frangipani trees and small trees filled with flowers. The frequently-watered garden in gorgeous in its green state, offset by the meandering white walkway that leads to the beach. The dainty pool throws of blue hues and offers a palette of bright colors that will find you unable to tear your eyes away. Clear blue skies, golden sand, and turquoise waters afford a breathtaking view at any given time of day, inviting travelers to lounge on the beach or near the pool. The rooms are beautiful, with bright but pleasing colors on the walls, cool floors, spacious and modern bathrooms, and every amenity is provided. The attention to detail at the premises sets us apart from others. With only ten rooms, the Villa maintains its cozy atmosphere and exclusivity, giving you a serene place to relax at, while still being in a central location. The staff are dedicated to serving you, ensuring all your needs are met with speed and precision. Delectable food, cooked to precision whether Sri Lankan, Asian, or continental, is best savored looking over the garden. The ease of access to the beach and the major towns in the area make the K. J. Villa in Uswetakeiyawa an ideal choice for any traveler, whether traveling for business or pleasure. The Villa is easily accessible from the airport, which is only 15 minutes away, and from Colombo, only 20 minutes away. Be pampered by our staff and enjoy good food and drinks when you visit the K. J. Villa.